Frequently we publish articles about the use and advantages of stock screeners. The investing via a stock screener is nothing less than the selecting of stocks that meet certain criteria. The core of this is the use of strong criteria that worked in the past and the use of a very wide spectrum of stocks. We do this filtering with almost all American and European stocks. We think it’s essential that investors invest over the borders in order to reduce their (systematic) portfolio risks and of course to take advantage of a way wider spectrum of stocks that always contain more cheap stocks. The portfolio’s systematic risk will be reduced because of the lower correlations from national companies with international companies. It’s quite astonishing that most of the value screeners outperform the markets for years but in many (mainstream) financial media we mostly read that growth strategies are better than value strategies. ”Value is dead” is an often used saying in the media. But we think the opposite is true. Many media or investors refer to hype stocks like Amazon , Alphabet and Netflix that all have extreme high classic valuation ratios (like the price/earnings, book to market ratio, dividend yield etc). We see these valuations even getting higher the past year , so many people often state that these old classic valuation ratios are not relevant anymore. But this is only the case in individual stocks. When we look broader, so market wide, we see that stocks with lower classic valuations outperform the stocks with the higher valuations. We see this almost everywhere: in the US and in all European countries. We think the extreme cases like Amazon , Alphabet and Netflix are just exceptions. Of course we are also very big fans of index products (ETF’s). With ETF’s you have a very big diversification and very low costs. It’s hard to do it better than ETF’s: over 90 percent of the active funds underperforms the ETF’s, especially after the deduction of costs. ETF’s are good, but not optimal. We see that with the use of quite simple stock screeners you can even outperform the strong ETF’s. The big disadvantage of ETF’s is that they are mostly invested in the large and megacaps. But historically we see that the smaller stocks outperform the larger stocks: the premium on size, also called the smallcap premium. Of course, the smaller companies have higher risks than the larger companies, but this problem can mostly be circumvented by a high diversification. Of course you have a high diversification with most ETF’s but the majority of them is mostly filled with the larger companies so there is no benefit of the premium for the smaller companies. The reason that most ETF’s mostly invest in the larger companies is because of the higher liquidity. ETF’s are very popular, so a lot of money flows to them, so the ETF’s can only invest in the larger companies as the smaller companies are too small to invest in. But as a private investor you can easily invest in the smaller companies and try to benefit from the small cap premium. When you use a stock screener you can directly find the smaller companies that are cheap. If you just buy like 20 different, preferably international companies, you automatically reduce your systematic risks. We now look at the differences between the performances of the popular stock indices like the FTSE100, S&P 500, AEX and the Xetra DAX. These indices are widely known as good proxies for the average market returns. We look at the total return of 100 USD invested in 2004 in all of these indices. We see that all indices gained over the past (long) period. That’s no surprise of course. The German DAX index was the best over this period: 100 USD invested in 2004 is now a bit more than 300 USD. This is not really a surprise as the German DAX index includes the dividends. The number 2 here is the Dutch ASCX index (a Euronext index for smaller companies). It’s also no surprise that this index scores above average as it’s mostly invests in the smaller companies. So with investing in the major stock indices you gained the past years of course but with some good stock screeners you gained a lot more. We now look at our top stock screeners: how much is 100 USD invested in them over the period 2004-2018? Now we see way higher returns. All these 10 stock screeners massively outperformed the major stock indices. 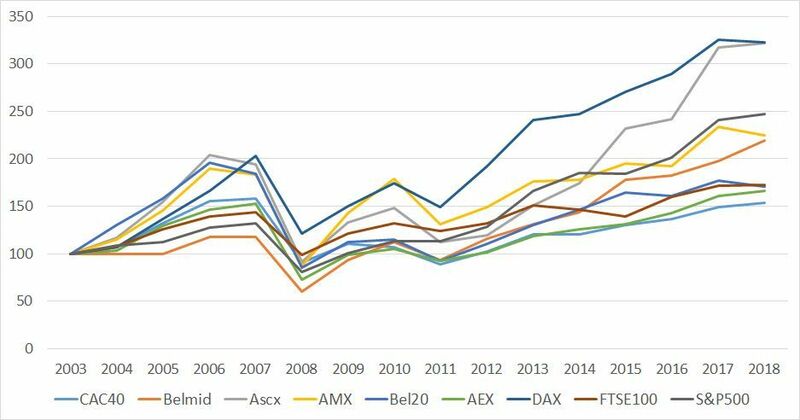 The best stock screener for the total spectrum US and Europe over the period 2004 till 2018 was the James Montier screener. 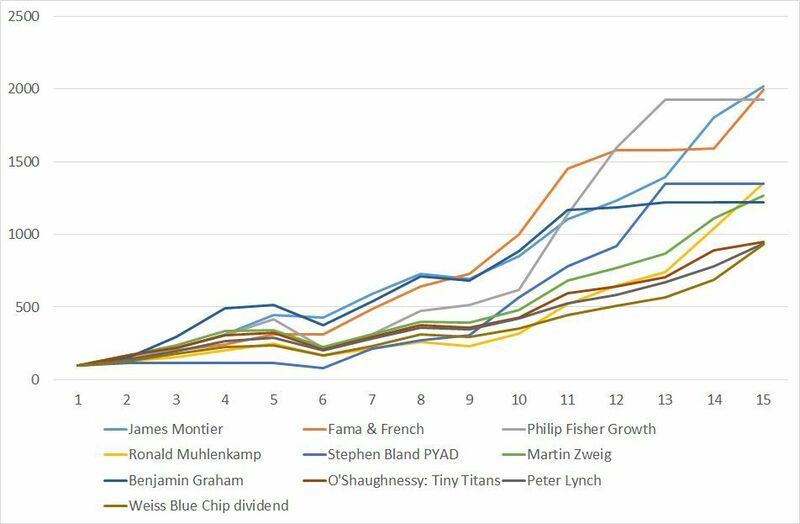 Other well performing screeners are these from Ronald Muhlenkamp, Fama & French, Benjamin Graham and Martin Zweig. The average of the top screeners is around 15 percent per year. Of course also in the crisis from 2008 all stock screeners lost a lot. We see this world wide. But in the years after 2008 many (value) stock screeners regained lots of the losses.